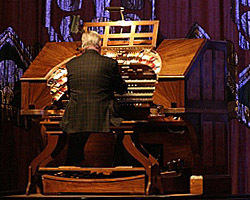 June 2, 2000 — Incredibly, a Lafayette resident used to have a Wurlitzer organ, a massive, elaborate and expensive theater organ. installed in her home, and 31 years ago, when Jim Riggs was in the seventh grade, he took a class field trip there. The organist had constructed her entire house around the mighty instrument: The living room served as a mixing chamber, and in the basement was a turbine blower as big as a Volkswagen. The instrument's sheer size and intricacy was impressive, but then the woman sat down at the console and started to play. "It was really like the clouds parted and a ray of light shined down. It was a sound I was waiting to hear," said Riggs, 44. "There I was, a 13-year-old, snot-nosed kid with tears running down his face, and I knew at that moment, that's what I had to do." Riggs, the organist at Oakland's movie palace triumph, the Paramount, has never swayed from his startling adolescent realization. He taught himself to play at his Contra Costa neighbor's house and on an electric organ at his high school. Since then, he's played theater organs at the Castro Theater in San Francisco, the Grand Lake Theater in Oakland, the Stanford Theatre in Palo Alto and on dozens of organs around the world. He's released four CDs and has an enduring passion for accompanying silent films with live music — often scores he has composed himself. "Few people find their life calling ever," Riggs said. "To find it so early is really great. But it's bittersweet, because it's very fulfilling to play the instrument, but it's probably the world's most impractical instrument. You can't take it with you. It requires a huge amount of maintenance. The air pressure is so high, it's constantly trying to blow itself up." But Riggs, who wears suspenders, keeps gold pens in his front shirt pocket and looks as if he might have dropped in from another era, has not allowed impracticality to interfere with his dream. For 11 years, he's played the Paramount, rising out of the depths of the stage on a movable platform as people file into the gloriously restored Art Deco theater. The crowd cheers as his hands and feet run nimbly over the organ's 244 keys and 32 foot pedals, and symphonic sounds float out of the titanic grilles on each side of the stage. He plays music popularized between the wars, from Sigmund Romberg operettas to Frank Sinatra songs, and before the curtain goes up and he magically disappears again, he turns — still playing with one hand — and waves to the crowd. They always love it. "It's a sound like no other. It never fails to impress people," Riggs said. "A theater organ like the Mighty Wurlitzer is meant to sound like an orchestra. It's made to sound like each instrument: piccolos, tubas, strings, drums, cymbals, traps. Basically, it's like a one-man orchestra." "It always grabs people, gets their toes tapping. There's a lot of angry music out there," he said. "It's really nice to play something on the other side. My aim is to have people walk out feeling better than they did when they walked in." Ken Walters has been giving tours at the Paramount for 10 years, and hears Riggs play as many as 100 times a year. "Jim is very unusual. Most organs sound like organs. Jim tries very hard to make it sound orchestral," he said. "I think he's one of the great organists of the whole world." The Wurlitzer was installed at the Paramount in 1981, nearly a decade after the building itself was restored to its former glory. It is larger than the theater's original organ, and, according to Riggs, it is one of the best in the world — due in no small part to the spectacular room it inhabits. The theater organ, which had its heyday in the 1920s, would have cost around $70,000 to manufacture at that time. The symphonic sounds are produced by a complex system: A blower supplies wind, and the impulses generated at the console are sent by an electromechanical relay machine — or computer software in some cases — to the right pipe, drum or percussion instrument. The organ at the Paramount has 1,800 pipes, plus another 350 or so percussion notes. It includes two xylophones, an upright piano, two marimbas, a celesta, a glockenspiel, chimes, a vibraphone, drums, cymbals, sand blocks, castanets, bird and boat whistles and a set of tuned sleigh bells. "It's probably the most complicated and — even at the time — expensive instrument ever produced," Riggs said. Because the instrument is so unwieldy and unusual, there is a terribly small group of serious players — maybe two dozen in the world. "I'm a big fish in an almost dry pond," Riggs said. He worries, naturally, about the future of the instrument. "All of us do," he said. "That's very foremost in our minds. But it will never completely die because there will always be a few, like me, who will get the bug."